Kidney CRISPR: How Close Are We? CRISPR (clustered regularly interspaced short palindromic repeats) gene editing is making huge waves in biomedical research. In fact, the lay press is devoting significant coverage to CRISPR as well. See this interesting piece on CRISPR from 60 Minutes. CRISPR technology allows for relatively cheap, targeted, gene editing that has the potential to directly fix gene mutations. Biomedical laboratories around the world are deploying this technology to knock out/in genes, alter expression levels etc. In 2017, CRISPR-Cas9 made it all the way to the finals of NephMadness. 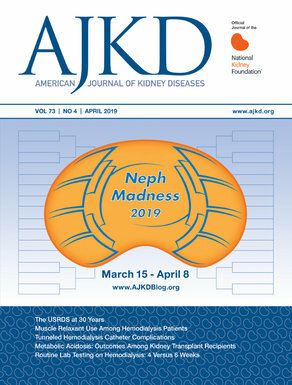 Cruz and Freedman discuss the potential use of CRISPR in the field of nephrology and kidney research in a recently published Perspective in AJKD. The name CRISPR sounds fun and whimsical… but what does it mean? At first glance you may be thinking of a technique to air fry potato chips. Actually, CRISPR is a sophisticated surveillance system used by prokaryotes to find invading viral DNA and remove it. The principle is that prokaryotic organisms continually produce a vast array of short RNA sequences that are complementary to potential invading virus DNA. Once they enter the nucleus, they bind, and Cas9 is there to ensure they do not integrate into the host genome. The basic premise of CRISPR is that a DNA-cutting enzyme (Cas9) is attached to a guide RNA (one that the researchers have chosen) complementary for the specific area of DNA being targeted. This allows for specific gene alterations. CRISPR is cheaper and easier to use (fewer steps) so researchers from varied levels of experience and funding could use the technology to alter DNA. The end product is specific and efficient gene alteration. How about nephrology-focused endeavors? Let’s take a quick view of the various ways CRISPR is being used in kidney diseases. CRISPR in cell culture/mice – CRISPR is used in a wide array of applications from standard knockout in vitro cell culture systems to the creation of genetically modified animals. CRISPR is becoming standard technique to remove or overexpress the gene of interest and examine the phenotype. This is the mantra of basic research. The advantage with CRISPR is that researchers can efficiently knockout a gene of interest in a cell line. This is a huge advance from the old knock down approach with silencing RNA (siRNA) technology, which only allows for partial reduction in gene transcription. With CRISPR you can achieve complete absence, thus allowing for a very robust platform to test gene function. The number of studies using this approach would be too long to list. Another powerful application is the creation of knock out/in mice (and other animals). This technique utilizes the injection of guide DNA and Cas9 into a zygote to create specific gene deletions or gene mutations. Examples include the creation of a mouse model with a missense mutation in Lamb2 found in a patient with Pierson syndrome. CRISPR in human organoids – Mouse models are expensive and time-consuming to make. What can be done to accelerate this process? One possibility is the production of organoids. Human pluripotent stem cells (hPSCs) can be coaxed to differentiate into various cellular compartments of the kidney such as podocytes, proximal tubules, and distal tubules and can coalesce into arrangements of cells termed organoids. After the organoids are created, CRISPR is applied to introduce discreet mutations seen in human kidney diseases (podocalyxin, PKD1, PKD2). Importantly, these organoids resulted in phenotypes consistent with human disease (podocalyxin- junctional defects in podocytes, PKD 1/2 resulted in dramatic cyst formation). This application allows for an in vitro system to understand biology and potentially find and test novel therapies. CRISPR in gene therapy – As more data is gathered, we are finding more and more kidney diseases due to single gene mutations. The most prominent example of that is polycystic kidney disease. Can CRISPR simply fix the mutation and solve this problem? While the use of CRISPR is extremely attractive for gene therapy, there are issues that need to be tackled. First and foremost is the need to ensure that off-target gene mutations are absent/minimal. Recent enthusiasm has waned after several studies showed potential inadvertent gene mutations here and there. However, another paper that reported off-target effects was retracted. A recent trial in humans using CRISPR in sickle cell was halted. Another study suggests potential immune activation against Cas9 itself. Thus, the use CRISPR for gene therapy is still in the early phases. 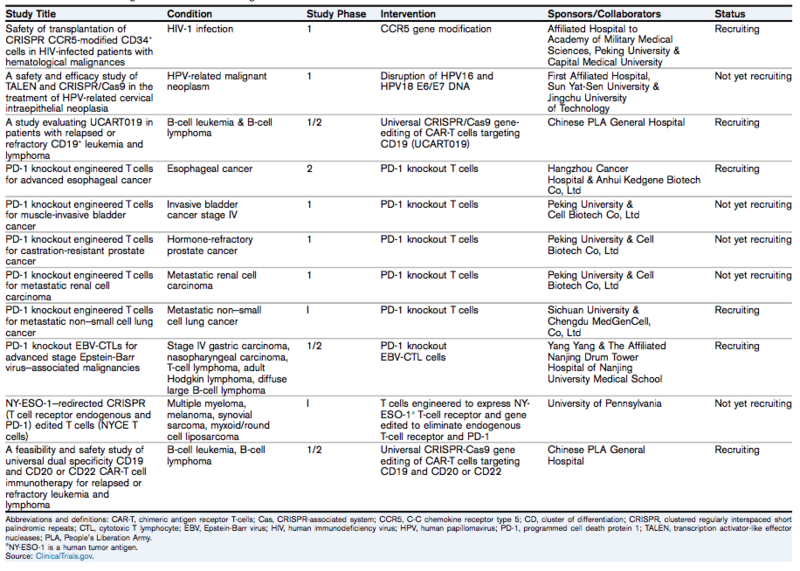 A majority of clinical trials (Table 2) are in cancer. However, researchers are eager to deploy the technology to other known genetic disease. It is clear we have a few kinks to work out before we are there. Clinical Trials Using CRISPR for Gene Editing. Table 2 from Cruz and Freedman, AJKD © National Kidney Foundation. CRISPR to transplant non-human organs – The use of non-human organs (especially pig) for kidney transplantation has been talked about for over a hundred years. Unfortunately, the human immune system would quickly recognize this as foreign and reject it immediately. This is where CRISPR comes in. Researchers have used an interesting technique using CRISPR to remove 3 porcine antigens responsible for hyperacute rejection in pig organs potentially transplanted to humans. This could allow for transplantation of many needed kidneys in patients on the waiting list. However, many hurdles such as porcine endogenous retrovirus (unfortunately named PERV) need to be overcome. Conclusion – It is exciting to see the rapid application of CRISPR to study human biology with the potential to accelerate discoveries. Even more exciting is the eventual potential to actually fix genetic kidney diseases. However, we still have a ways to go before gene therapy is something seen in the clinic. No doubt CRISPR is a powerful tool but issues remain before being routinely deployed in patients. – Post prepared by Matt Sparks, AJKD Social Media Advisory Board member. Follow him @Nephro_Sparks. To view the Cruz and Freeman Perspective (subscription required), please visit AJKD.org.